A. Chris owns two triangle-shaped tables for his room. Triangle ABC is similar to triangle DEF. 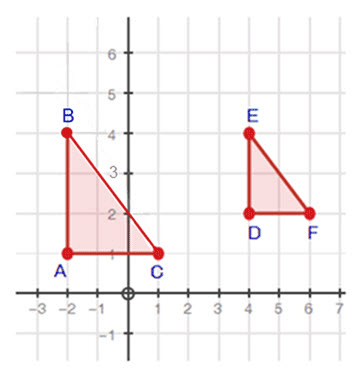 Using the image below, prove that lines BC and EF have the same slope. You must show all of your work to receive credit. Triangle ABC and DEF are shown below. A is at negative 2, 1. B is at negative 2, 4. C is at 1, 1. D is at 4, 2. E is at 4, 4. F is at 6, 2. B. Chris is now trying to buy ribbons to decorate his room. A point T on a segment with endpoints D(1, 4) and F(7, 1) partitions the segment in a 2:1 ratio. Find T. You must show all work to receive credit. C. The points on the following shape represent the areas in which Chris will decorate his room with the ribbons. 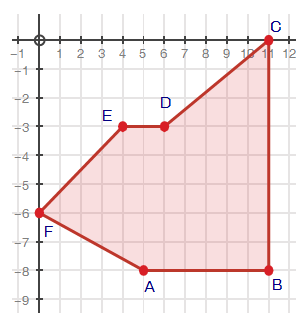 Find the area of the following shape. You must show all work to receive credit. Figure ABCDEF is shown. A is located at 5, negative 8. B is located at 11, negative 8. C is located at 11, 0. D is located at 6, negative 3. E is located at 4, negative 3. F is located at 0, negative 6. Just what I was looking for, it makes a lot more sense now.